After ten years with my Rally I know every inch of it, and having rebuilt the engine and suspension, the wiring is now the worst part of it. I've had a couple of electrical issues over the years, and managed to fix them, but I know where all the bodies are buried. It's only a matter of time before this 42 year old wiring strands me, and I'd rather get ahead of it. I think it's time for a new wiring loom. SIP has a variety of looms for sale, and I've confirmed with them that this one is the best fit for my Rally. Mine is in original configuration, with Femsa ignition and US indicators. I'll have to modify this loom slightly to add leads for the rear indicators, but otherwise in theory it should be plug and play. Just wondering if anyone else has experience using these looms or other ones. I'd like to do this replacement over the Aussie winter. I replaced mine in my double yellow p with the SIP worked great only difference was the color of one wire on the turn signal circuit and an extra ground terminal near the battery. Everything works great. I hope it comes with a diagram as I see there's not one on the page. Also I hope it's absolutely perfect in every way as I've just ordered a SIP loom for the smallframe. 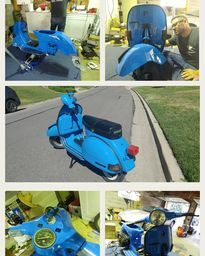 It hadn't occurred to me that they would use different colors from the stock harness, so I thought the wiring diagram from Scooterhelp would be sufficient. I also just realized that this loom doesn't seem to have leads for the front brake light switch. I'll have to look into that. 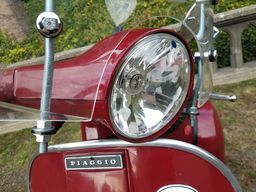 well, you can always Tee a pair of wires down to your rear brake light switch so that you can activate the brakes lights via the front brake lever. And since you have had the harness in your hands, does it feel like SIP uses quality wires and terminal ends? Yeah, I am expecting to have to feed some additional wires around, so I just need to tally them up. I'm happy with the quality of materials used. 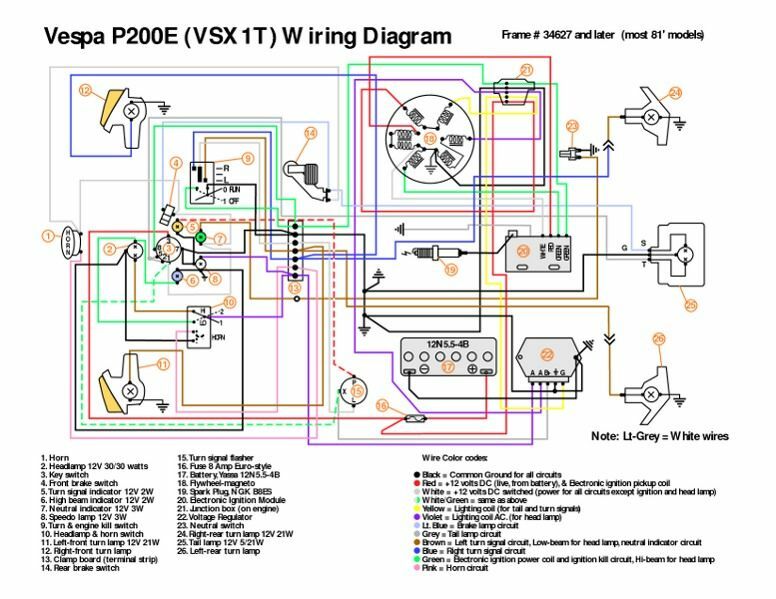 I know from experience that this wiring diagram is accurate for the US bike, and I can see that the new loom uses some different colors for the switches and indicators. Probably correct for the Euro bike. So I will just need to use the multimeter to trace things out. I'll document this for future generations. 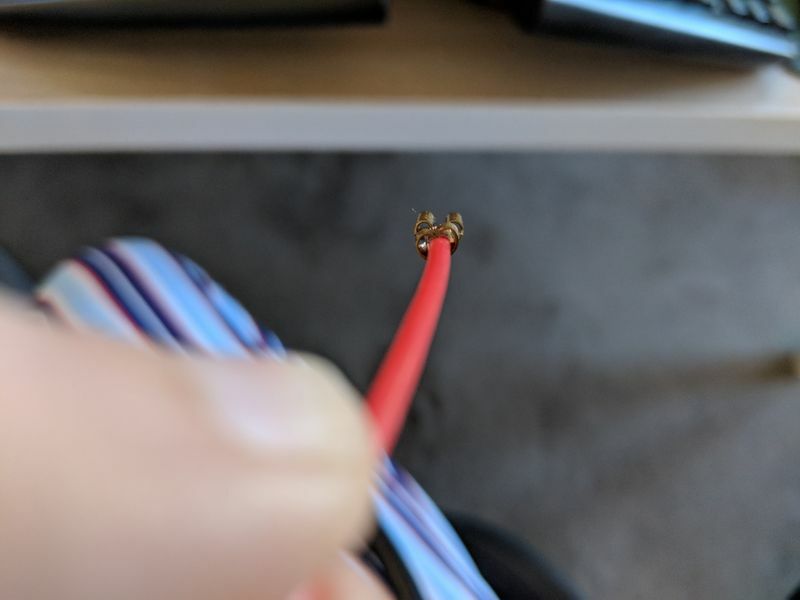 I am a little disappointed about the quality of the connector crimping. Almost all of them look like this. The rear tabs should enclose and grip the insulation, for strain relief. I'm going to have to fix these up myself. I'm trying to figure out how I will modify the new wiring loom to run the rear indicators on my bike. I know the current setup, as on the P series bikes, powers them through the pins on the cowls. But where/how are the electrical connections made inside the openings in the chassis that the pins go into? Can anyone show me a picture of this, or describe it? I wonder if those wires even run through the main loom, or if they were wired separately because they only went on the US bikes. Then again that wasn't the case from the P series onward, so you'd think those would have integrated these leads into the loom. Hey Auto - I don't know if this is going to answer your question or not, but hopefully this will help you figure it out. I've got a 79 P200 US version. The cowl pins are the hot wire to the blinkers. Brown for left, and Blue for right. The cowl catch is the ground (Black wire). All three of these wires go into the wire loom and connect at the block under the horncast. I'm going to post a pic of the inside under the tank, and a wiring diagram. I hope this helps! The Brown wire (Left blinker) goes to the cowl pin and the black wire at the end of the spring is grounded through the loom at the connector block under the horncast. Yup - under the tank. This picture was taken just a few days ago. I put in a CHT and ran the wire up to the horncast. I ran an extra green wire and a couple of spare "stringers" from weed whacker string for future use or just in case. You can just see a bit of the brown wire, and the black wire on the end of the spring. They both feed into the loom and up to the junction block under the horncast. Oh, and while you have the tank out you might as well replace the fuel line. And I'm glad I could help! Keep us posted when you get it all sorted! Good point on the fuel line, I even have a spare length ready to go from a previous effort that I ended up aborting. 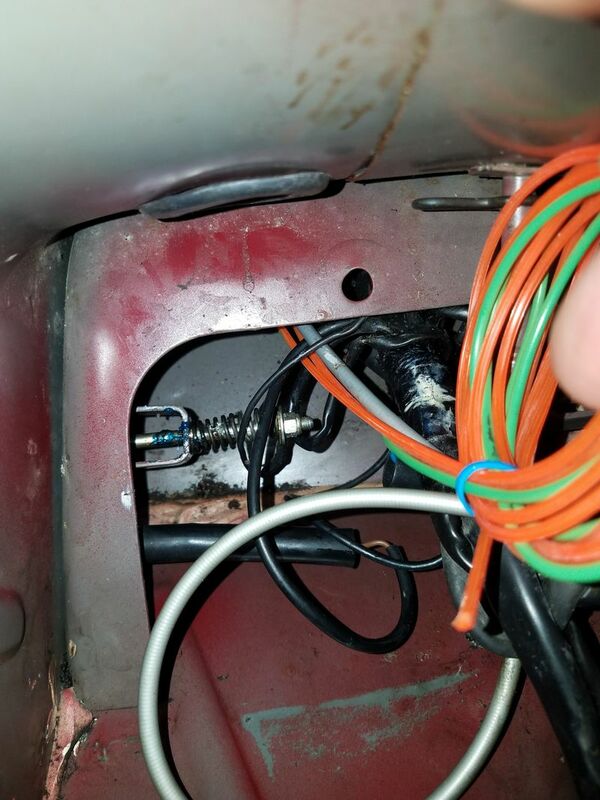 I'm surprised that they bother to run a ground wire from the spring through the chassis. I would have thought they would just ground to the chassis itself right there somewhere. How did you fish the new leads through the frame without removing the old harness? I'm intending to tie pull strings or wire of some kind or other to the old harness and feed them through as I remove it, and then use those to help pull the new one into place. Basically I ran an electricians fish tape from the horncast area to the tank area, then gently pulled it back through with the bundle of wires taped to it. It wanted to hang up around the rear brake area - it got kinda tight, but I just pulled a bit harder and it popped through. I've got pics in the thread above. What you're going to do sounds like it'll do the trick and you won't need to use an electricians fish tape. Thanks a lot! Just gives me an idea of what to expect when I get my stuff apart. Much appreciated! Years ago replaced a Rally 200 loom and still have the scars. This was pre SIP days and used a Beedspeed one. The biggest challenge was there is a welded plate in about halfway to the rear brake that has two holes cut through for cables and loom. My loom kept getting caught on that point and had to stick my hand deep inside the body to get a draw wire through. That hole is pretty tight and ended up having to remove the side cover clips and springs even then I could only just get my hand in. Out of interest why keep the indicators? Pre 76 should just squeak into the "none required"ADR rules same with the front brake. Do you have a neutral light? 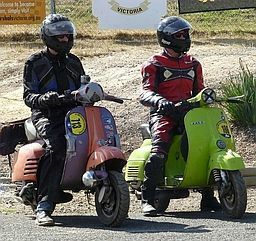 Recall a Victorian Rally that had one back in the day that had been a private import. I have small hands that can get into tight spaces, I've done work at the back of my Porsche engine that everyone else says you need to drop it to accomplish. I also have a flexible inspection camera, and I'm planning to pull a gear cable through when I remove the old one, to use as a guide/pull wire. With all that, I think I'll manage, but yeah not looking forward to it. I didn't think the blockage had holes in it, I thought it was two fences, one welded to the top and one to the bottom of the tunnel, so you had to go over one and under the other. Maybe that's a different model. I like the fact that my bike is bone stock except for the pipe, and the indicators work fine, so why not keep them? It doesn't have a neutral light, I've never seen that on a Rally. A camera and small hands will make the job a bunch easier; wish I had them as it would have saved hours of garage time! Might be wrong but the US Cali Rallys required a neutral indicator by law. My Rally had had bar end indicators but they had got "lost" between delivery and being acquired in the late 80's. Was registered with none as a pre compliance version. Someone imported at least 1 Rally from the US. It used to turn up at national meets in the early 90's and had the US indicators and sensor on the gear selector box. OK, I need some help from the brain trust. I spent some time earlier today mapping out what is different from the Euro wiring loom that I got from SIP, and my stock US wiring. I had thought it was just the indicators and kill switch, but now I'm going down a rabbit hole having discovered that the wiring from stator to regulator to the rest of the bike is also different, and I can't quite wrap my head around why. I would really like to understand this so I can figure out how the new loom is going to hook up (with or without further mods). Attached is a scan of the wiring diagram I received with the loom (if anyone can share a clearer copy of this, I would appreciate it - looks like it is from a service manual or something), and the diagram from scooterhelp.com which matches what is in my bike. I will refer to these as the US vs. Euro wiring. The US wiring has two yellow leads running from one coil of the stator, through the junction box on the engine, and into the regulator/rectifier. The Euro wiring has only one yellow lead. Question: why two leads vs. one? I think I will need to add one to work with my rectifier. The US wiring has a pink lead coming from the rectifier, through a fuse to the battery, and also jumpered at the fuse into a red lead which goes to the key switch. The Euro wiring just has a red lead which goes straight to the battery (and testing my harness indicates it does not go anywhere else). Question: I must be missing something, but how is power getting from the battery into the rest of the circuit in the Euro wiring? This is where I am really baffled. The US wiring has a purple lead coming from the rectifier to the indicator flasher, which is jumpered to a green-and-white lead which goes to the keyswitch and then to the horn. From the horn it appears to jumper to a green and black lead which then goes to the hand and foot brake light switches. The Euro wiring has a purple lead which goes from the rectifier directly to the key switch. The Euro indicator flasher seems to get power via a yellow lead from the foot brake switch. So in the Euro system, it seems that one output from the regulator JUST charges the battery, and the other goes to the key switch and then to everything else. But how does the battery power anything? Is there also a jumper at the regulator so that battery voltage can flow through it to the other output? If your head is swimming after trying to read this, look at the diagrams. If it's still swimming, you will see where I'm at. I'm not sure how I am going to wire my stator, regulator, and indicators with the current harness. It seems like the difference in regulator design may impact a few things. If anyone has insight about that, it might be useful! Electrical stuff can make you crazy. Before getting too wrapped up in wiring diagrams and wire colors, the first thing you need to do is figure out your “end game”. Are you trying to re-create the stock US electrical wiring on your Rally? Or are you doing the Euro wiring? Or some variation? If you’re just trying to add flashers to your US bike, take both harnesses out and lay them side by side. Forget about colors for now... figure out what connections are missing from the new harness and just add them. 1. Why two yellow leads vs. one? US battery bikes used a “double yellow” off the stator for rectification. Euro’s are rectified differently. You’ll need to run a second yellow wire from the terminal to the US rectifier. 2. How is power getting from the battery into the rest of the circuit in the Euro wiring? Through the key switch. 3. Is there also a jumper at the regulator so that battery voltage can flow through it to the other output? Basically yes. That’s a diode AC/DC converter. It’s the Euro equivalent to the US rectifier. I guess another option is to re-create the original loom? More work but less brain pressure! With the old loom pinned down on a board and unwrapped, it ought to be pretty easy to copy. Just need a decent stripper and crimper, and of course some good quality connections and wire of the right colours. Thanks SocalGuy, that helps! I'll definitely add a yellow lead for the regulator, and knowing that current can flow back through the regulator from the battery to the key switch in the Euro setup helps clarify things. It's interesting that the Euro setup does not seem to have a battery fuse. Ginch, I definitely think laying them out will help, but I think I can make do with what I have for some things. It may not be practical to try to replicate the US harness exactly.